Summer is just around the corner and that means that it’s time to start dreaming about your summer holiday plans. One thing that’ll be on plenty of Kiwis lists is steak on the barbie. We all have a personal preference of how we like our steak cooked, but which cut of beef produces the perfect steak? We are spoilt for choice here in New Zealand with such an array of delicious beef steaks available, but choosing a steak and relying on someone to cook it to your liking can be a bit hit and miss. So for a memorable steak dining experience, why not leave it to the experts and visit a steakhouse? Here’s a list of some of our favourite restaurants to enjoy a steak over the break. Jervois Steakhouse is an Auckland institution and their menu will leave you spoilt for choice, but rest assured the friendly front of house staff will ensure you pick the correct cut for your palate. Mix and match with your favourite sauce and a couple of sides and you will leave feeling very satisfied indeed. 21 Days is located in Browns Bay, near the coast on the North Shore of Auckland. Head Chef Bob Lun has a great pedigree: he worked for the Nourish Group for 14 years alognside Simon Gault, was Head Chef at Jervois Steak House in Ponsonby, and set up Oyster & Chop in the Viaduct. Their menu includes over a dozen cuts of beef and lamb, including some great steak options, all of which are cooked to perfection and accompanied by delicious sauces. The steaks at Smith & McKenzie are all handpicked by their butcher and aged for 21 days to maximise flavour and tenderness. Their signature steak is a whopping 500g Hereford prime rib on the bone and slow roasted to perfection for 18 hours. The sublime smoky flavour infused into the steak perfectly complements this gorgeous cut of meat. Butcher turned Head Chef Harry Williams of Alpha Street Kitchen & Bar knows a thing or two about good steak. 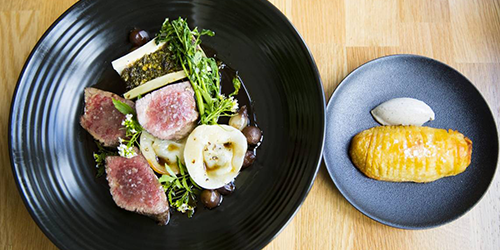 The stand-out oh is menu is a free-range, grass-fed Hawke's Bay waygu beef is from farming co-operative First Light. The whole rump cap is brined overnight in a solution of salt, sugar and water before it is cut, fried, finished in the oven, and served medium rare. Specialising in prime cuts of meat from sustainable farms which have been carefully considered for flavour, texture and agricultural practices, Meat & Liquor never fails to deliver. Their talented chefs and impeccable service will ensure that you’ll have a night to remember. The Canterbury Plains Angus beef rib eye on the bone is not to be missed. Scott Kennedy, the Head Chef at Nero, knows a thing or two about meat. He was awarded the title of Beef & Lamb Platinum Ambassador Chef in recognition of his skill with beef and lamb dishes over a number of years. Nero’s award-winning menu features a 42 Day whisky dry age wagu weighing in at an impressive 500g. It is served with duck fat potatoes, beef crackling chimichurri sauce & black garlic butter. Portlander is an, the award winning upmarket grill house,with a seasonally changing menu that is coveted by steak lovers across the capital. Our pick is the lean and meltingly tender, handpicked 55 day aged beef fillet that is guaranteed to satisfy. It’s served with a generous portion of confit garlic whipped mash, sauce, and a fresh slaw with crispy pepitas and sesame seeds. Traditionally the domain of members of parliament and later to parliamentary staff as well, Bellamys is opening its doors to the public for the first time. Bellamys by Logan Brown offers locally sourced, premium meat cuts that are expertly cooked and delightfully flavoured. 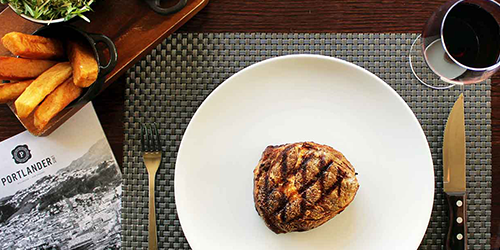 A must-try steak on their list is their 180g Angus Pure Beef Fillet. Moving South, you shouldn’t leave Christchurch without checking out The Flaming Rabbit. You’ll be welcomed by a chiller full of ageing meat as you arrive. You can look forward to meals full of flavour and generous portions. The 45 day aged Flintstone rib-eye, which is paired with seasonal vegetables & hand cut Agria chips, is a joy to behold. 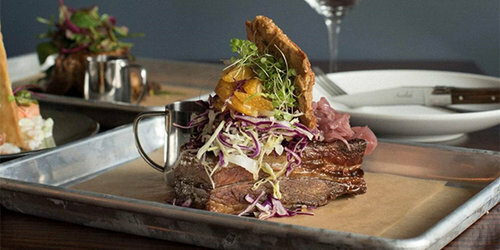 This gastropub, nestled in the heart of Queenstown, is famous for its great service, friendly staff, and beautiful cuts of meat. The Hareford beef rump, best served medium-rare, is prepared in a fantastic Texan dry rub and red wine gravy is a knock-out steak. Muskets & Moonshine is a must-try tourists and locals alike! This Dunedin hotspot excels by pairing the spice and flavour of authentic American barbecue with premium-quality New Zealand meat. All meats are smoked in-house, low and slow, which means smoky, juicy and delicious meat. You’ll love the beautifully smoky sous vide flank steak. The flamed mustard butter really brings this great steak together.